It is likely that some very deceptive, weird or hysterical arguments will be made the course of the day by organisations that usually avoid situations where they may be called out it. 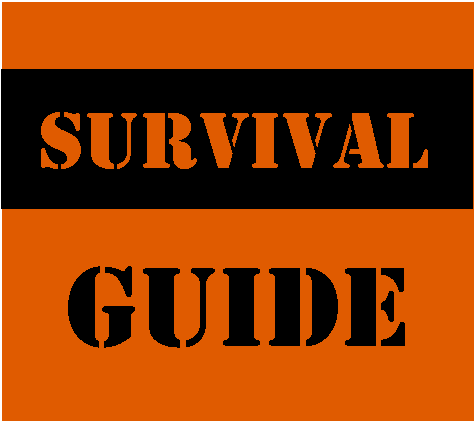 So here is a brief survival guide to the day. The ultra-simplistic campaign narrative of those trying to shut down the harm reduction option in the United States is basically: The predatory tobacco industry uses candy flavours to hook children on nicotine and capture them as users and eventually smokers. Every element of this claim is wrong. There is no evidence at all that certain flavours (i.e. those with childish associations) are a sufficiently strong attractor that they can get kids to vape who wouldn’t otherwise vape. Obviously if all flavours tasted disgusting then no-one – kids or adults – would vape. So it is a non-question to ask kids if they like the flavours. Of course they do. It doesn’t mean they vape because of a particular flavour. 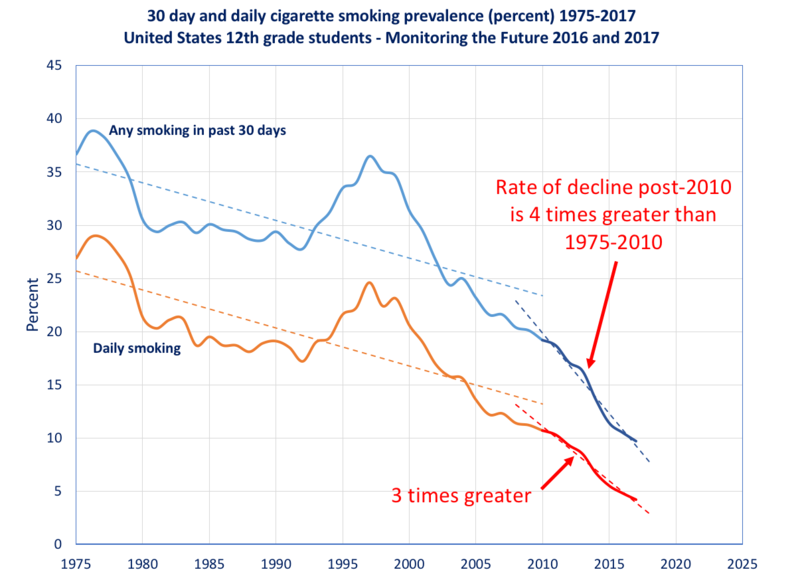 Adolescents actually give quite positive reasons for vaping – quitting and harm reduction (see Saul Shiffman analysis of PATH data). The killer point: if vaping is an alternative to smoking (which is more likely than not), then wouldn’t attracting kids who would otherwise smoke to vape instead be a good thing? And – the corollary – deterring them may lead to more smoking. The flavor spinners simply cannot cope with this modest level of complexity, so they just ignore it. Wish it away. What most of us think of as tobacco companies (Reynolds, Altria, BAT etc) don’t make anything that looks remotely childish. The claim is based on defining every vape enterprise as ‘the tobacco industry’ and then generalising the practices of the ones they like least to the whole industry. Please see my blog posting: Are e-liquid flavours really ‘hooking another generation of kids’? Or just consider this graphic showing 12th grade smoking for 35 years before and accelerating in 6 years after 2010. Does the trend prove vaping caused the smoking decline? No it can’t do that. But does it suggest it is wise to close down thousands of vaping businesses? Absolutely not. 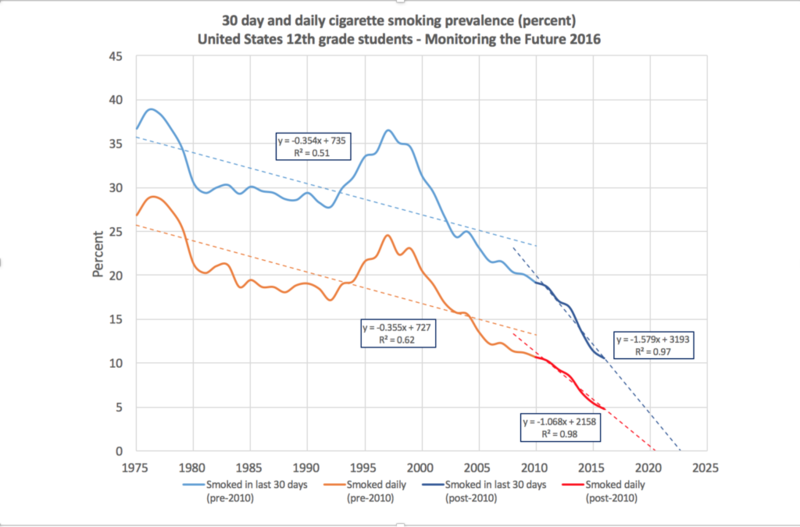 Accelerating decline in smoking in 12th Graders since 2010 – what could have caused this? For many of those trying to stop the harm reduction option, the FDA is their hammer. FDA is the means to crush the companies involved and eliminate most of the products. Its massively bureaucratic and risk-averse approach is designed to prevent innovation, and was conceived before the opportunities of harm reduction were widely recognised. other institutional changes, such as FDA monitoring of product developments and changes and required ingredient listings, which will enable FDA to propose more informed regulations appropriate for the protection of the public health. We show these purported benefits are nugatory, would happen anyway or are actually harm-causing. What FDA has not done is assess how many vapers may relapse to smoking and how many smokers will not switch. We show the numbers are completely dominated by the values that should be attributed to the costs of any extra smoking – and only a tiny amount extra blows the case completely. 4. Matt Mayers is present!!! Are you a soldier or a scout? Are you a soldier, prone to defending your viewpoint at all costs — or a scout, spurred by curiosity? Julia Galef asks why you think you are right – even if you are wrong (TED) and this article. It can happen, even at a conference like this. Try my ‘Rethinking nicotine’ quiz… If nothing else, it will wake you up and make you think. If you are there, enjoy the day! “The question is not; what view of the phenomenon should we take in order conveniently to explain it in terms of some philosophy or other? On the contry, we should ask what philosophy is called for, if it is to live up to the subject and be on the same level? Not how must the phenomenon be turned,twisted,narrowed, deformed in order to be explicable at all costs according to principles ourselves have resolved never to go beyond. Rats. And I’ve always prided myself “getting” British humor. I’ve met my match. Touche. Yes – sorted that out now… thanks! Sorry, but I think I found another one. Did you mean to put the link “The ultimate guide to retirement” under #4? Okay – I guess the retirement joke. didn’t cross the Atlantic that well! This is awesome, Clive–thank you. Might I cheekily suggest that you consider adding a link to the piece, below. Not specific to nicotine or ecigs, but very germane to the challenge of facing and processing contrary information and views. LOVE this, Joe. Thanks for the link. You’re very welcome!! I love this kind of stuff!